Before I finally went ahead and ordered this Charlotte Tilbury Supermodel Body, I had my eyes on it for the longest time. 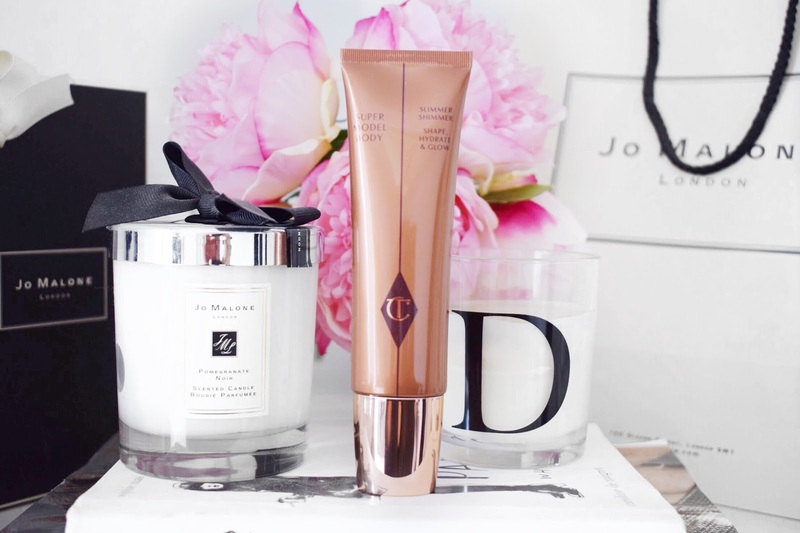 I am sure if you have followed my blog for quite a while then you will know that I am a huge fan of all Charlotte Tilbury products. Over the years, I have tried pretty much everything that she sells in her makeup line and I think that it is safe to say that I adore everything that I have tried. There has only ever been the Legendary Mascara that failed me, but I just glaze over that one. But, I knew that I wanted to try out the Supermodel Body, so I finally bit the bullet and bought it and I have to admit that I have been loving it ever since. I bought this product back in the warmer summer months and I have been using it ever since. I initially wanted this product to wear when I was a bridesmaid for my sister. I had a strapless dress and I wanted my skin to look as healthy and glowing as possible, without going in with 10 tonnes of false tan. I have to admit that I loved wearing this in the summer and I feel like it did everything that I wanted it to do. I think the reason why I have waited to share this post with you is because it is quite an expensive product and I wanted to make sure that I knew all of the ins and outs about it before sharing my thoughts with you guys! The first thing that I want to mention in this blog post is the packaging of the product. 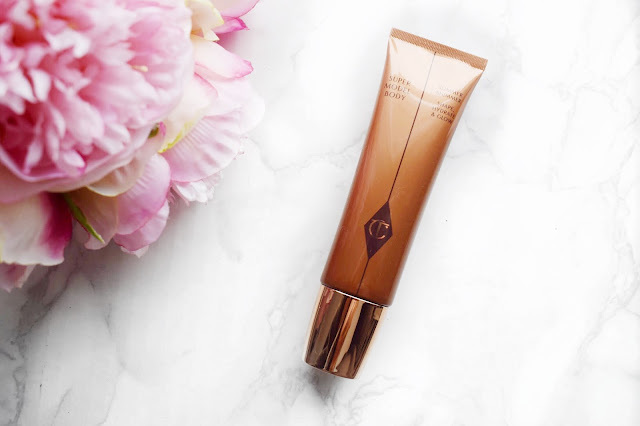 This Charlotte Tilbury Supermodel Body comes in a large squeezy tube and when you remove the cap from the end, it has a roller on the end which helps to apply the product. I have heard that some people didn’t like this, and they would rather it just have a pump so that they can rub it on with their hands, but it isn’t something that really bothers me. I actually quite like the roller on the end because it makes it so quick and easy when you are applying it down your legs or your arms. I will admit that it can get quite messy around the cap, but not to a degree that bothers me! Now, I want to talk about the shade of this product. When you roll this onto the skin the shade itself can look a little scary. Compared to my natural skin tone, this is a little deeper and I was worried that this would make me look darker, but it really doesn’t. Even though the initial shade is dark, once it is blended out into the skin, it is hardly detectable. The product itself is pretty sheer once it is blended, but it gives such an incredible glow to the skin. This product literally makes you look sun-kissed and like you are glowing from within. My only concern when I was buying this foundation is that it would transfer onto my clothes. I didn’t want to put this down my arms and then wear a white top and be able to see this product all over it, but that isn’t the case at all. What I like to do is apply this product and then I rub it in using a clean fake tanning mat. Then just in areas where I can get a little warm like the crease of my arm, I will go in with a touch of translucent powder on my huge Morphe brush just to make sure that nothing moves or transfers throughout the day. The test for this was actually on the day that I was a bridesmaid because I had this on all day long, I had an incredibly light pink dress and it was the heat of summer and there was no transferring what-so-ever! Plus, I feel like I should mention that in this product you get a very decent amount of product. In the tube itself you get 60ml of product, which is about double the amount that you would get in a standard foundation. I have been using the same tube of this throughout the whole summer and even during the cooler winter months and I still feel like it is going strong. The thing with this is that it seems to go a very long way. Because there isn’t a coverage per say to the product, you only need a small amount and then when you blend it out, it spreads to cover an even wider area. I think the question that I need to ask myself is would I repurchase this Charlotte Tilbury Supermodel Body and I think that I definitely would. I think that this makes the skin look amazing. It doesn’t add any coverage to the skin, but what it does is make you look glowing and it seems to balance out the skin which hides a multitude of sins. Every single time I wear this product, I am much more confident when I leave the house and I have different areas of my body on show, whether it be my legs, arms or chest. I am going to leave a link to this down below in case you want to check it out for yourself. Make sure to leave me a comment and let me know if you have tried this and tell me what you thought about it! It is such a lovely product, I am still so in love with it! It is the best product, obsessed with it! That feeling of finally getting your hands on something you've been eyeing for a while! Priceless. I would say that it is definitely worth the money! Thank you sweetie, it just added a lovely glow to the skin! It is another great product from Charlotte Tilbury! I wouldn't imagine so sweetie, it will just give a very natural glow! May need to try this out in the winter months when I'm feeling a bit starved for sun, or when I go to Miami in Feb and have to wear a bikini for the first time. Love Charlotte Tilbury! It is just the most stunning item! This sounds so amazing, then again you just cant go wrong with CT, its one of my favorite brands and it has never disappointed me. Me neither, it is an amazing brand!